Coming to a PC near you... the adventures of Alexander on his Mad River Rocket sled. As we join our hero Alex and his side kick Sarah (his three year old sister) we find the duo eagerly anticipating the arrival of the Mad River Rocket Sled. Finally one very sunny and dry day towards the end of January it arrived. Unfortunately it did not arrive with any new snow. As our hero waited and waited the foothills of Boise remained dry after such a great start to the snow season in December. Trip after trip we made up to Bogus Basin to ski with the new sled in the back of the truck hoping to stop in the foothills along the way. But the snow eluded us as the hills were bone dry every single trip. Unfortunately our hero also encountered the local law enforcement at Bogus Basin. No sleds allowed. Drat! We knew it was time for drastic measures as our reporting deadline loomed over us and the sled had yet to log any mileage. We loaded the kids up and headed out of town the first weekend in March. Up to McCall, Idaho and Brundage Mountain (approximately 2 hours from Boise). There our hero was not only able to ski but also was able to finally test the sled. Sleds allowed on the bunny hill. Yippee! The sled maneuvered very well. Although Brundage Mountain did not provide us any powder to test it upon it was still a great ride on packed snow. Not only was our hero able to get a quick smooth ride but his sister was able to ride alone too. The sled is great for either one or two riders. Our two riders have a combined body weight of approximately 90 pounds. We really liked the lightweight of the sled. It made it easy for the kids to handle. 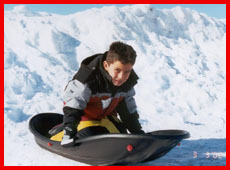 Both children sat comfortably in the seat with the strap and were able to easily get in and out of the sled. We also liked the width of the sled, as the kids felt safe sitting or kneeling in it. I believe that the kids could get quite a few seasons out of this model of sled. It is one that they could grow with. I think as my son gets heavier he would actually benefit from the sled and it's abilities even more. Currently he is about 52 pounds. I believe that the extra weight will make the sleds maneuvering features stand out even more. Another month has flown by and the month of March was just as dry as February (no snow) in Boise again. We decided to plan a ski/sledding trip to McCall, Idaho for spring break and were able to take along the Mad River Rocket for two afternoons of sledding at Brundage Mountain. Our testers for this trip included Alex (age 7), his good friend Nicholas (age 7), my boyfriend Anthony and myself as photographer. We tested the sled on mostly packed snow at the ski hill but also on some untouched snow. We tested the sled in the late afternoon so the snow was a little soft but it still managed to move along quite nicely. The kids were very excited at how fast it would go when the incline was steeper. And there were a few times when it was moving so fast that they almost ended up in the parking lot. I think one of the best features is that a slight weight shift allows the sled to make the maneuvers. However, as we discovered this does take practice not only with kids but adults too. There were lots of crashes, but the sled held up well. I think that the plastic is flexible enough to withstand quite an impact and still be in perfect condition. One can never be sure about the rider though! KidzStore: Buy a Mad River Rocket online!